In Brief: Beijing Hikers' Big Boss Huijie helped out in a re-photography project, and ended up featuring prominently in an interesting anecdote written by the author. 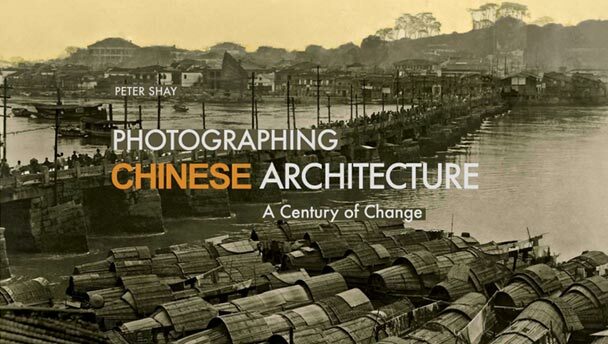 Back in 2011 Huijie helped out in a re-photography project, and ended up featuring prominently in an interesting anecdote written in the book's introduction by the author, Peter Shay, who had been trying for a long time to find the exact location of a Great Wall tower in a photo from the 1930s. 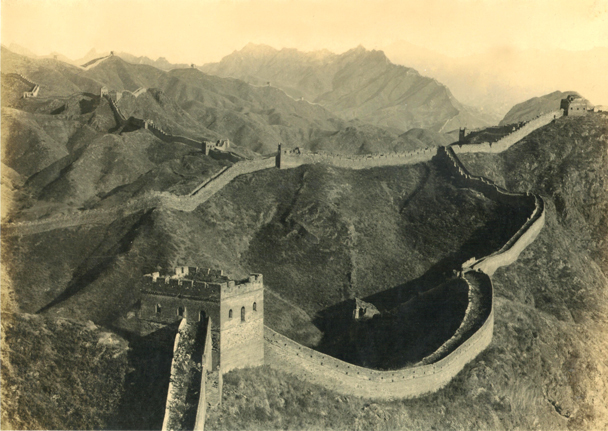 Peter Shay: “After being unable to find one particular Great Wall site during earlier trips, I decided to return to China again in 2011 to see if I could get to the section at Jinshanling and replicate what I felt was one of the most important old images in my collection. It was a task that captured my imagination, as I quickly realized I was going to need assistance getting there, finding and replicating the image. “During my travels, I often discovered that I needed significant assistance from people within and without China to help me find specific structures and to help me obtain access to different locations. This task sometimes required that I search the Web or contact people within China, review historical books and conduct other research to determine how access could be made. Seeking to locate the Jinshanling Great Wall section I searched the web to discover “Beijing Hikers.” I was able to make contact with Ms. Huijie Sun, the proprietor of the Beijing tour company who recognized the iconic view and offered to lead me on a guided trip to its exact location. On April 25th, 2011 at five in the morning I rendezvoused with Huijie equipped with her rugged SUV, outside Beijing’s Lido Hotel. After nearly a two hour drive north, we met up with local farmer Mr. Hou Qingshan, who spends most of his time managing a multi-generational farm nestled in a valley 125 kilometers northeast of central Beijing in the southeast corner of Hebei Province. “Unofficially, Mr. Hou acts as the self-appointed guardian of this remote section of the Great Wall. With great pride he led Huijie and me on a short tour around his small farm of chickens, saplings, crops, and a fenced-in herd of 60 long-haired goats, which roam the hilly countryside in search of nourishment and from which he draws an income from the shearing of their wool. As the sky began to lighten, Mr. Hou led the way towards the rear of his property from where the trek commenced up the path that he himself had crafted from packed dirt, stones, and cleared foliage. After nearly an hour of hiking, the three of us reached the tower that afforded the breathtaking view: the “East Tower with Five Holes.” From this vantage point I was both exhilarated and awe-inspired to see exactly what I had come to photograph, though somewhat vexed by an inability to compose the same photograph in order to make it a perfect match. It seemed that the view was from a slightly lower angle than from where the Japanese photographer eighty years earlier had set his camera. I looked around and realised that the earlier photographer had climbed to the top of the tower where I stood, a point which was no longer accessible without a ladder which I was told had once leaned upon the tower’s wall. I quickly realized that for me to attempt to scaled this wall would be an unwise endeavour. Within an hour I set up my camera equipment enabling me to take photos of this section of the Great Wall unaffected by shadows due to an overcast sky. It was one of the most successful day trips that added immeasurably to the fruition of the photo project. Quite a story, yes? The rugged SUV is due to be scrapped for not meeting emissions standards, much to our sorrow – the old thing has served us faithfully! Mr. Hou (actually Mr. Zhou) is still about, and we walk past his little farm every month or so on our Hemp Village hikes. 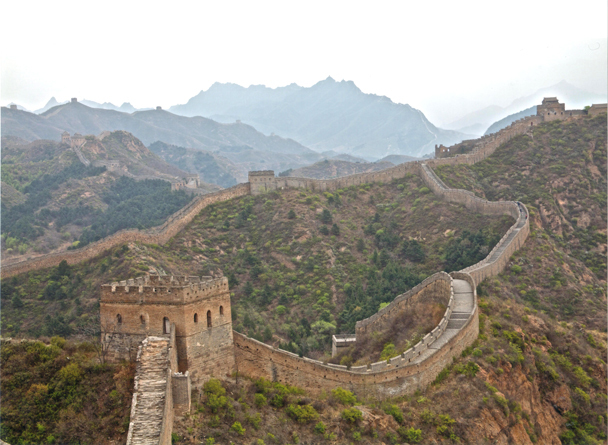 Jinshanling Great Wall, 2011. Photo by Peter Shay. Sections of the Great Wall at Jinshanling have been restored and renovated, and you can see in the photos where work has been done, especially on the stairs just behind the first tower and on a few of the larger towers in the middle. The shapes of the mountains haven't changed a bit!